One of the most awaited feature over the Windows Phone 7 in the upcoming days would be the Internet Explorer 9 (IE9) browser. The mobile version of the browser is expected to be made available for Windows Phone 7 devices when the Mango software update arrives, rumored to happen in the fourth quarter of the ongoing year. Even though rumors suggest a late landing, it is possible that the IE9 browser on Windows Phone 7 would arrive a bit sooner, though nothing is officially confirmed. If the browser arrives with the Mango software update, the mobile browser would feature various enhancements including Twitter integration in the People hub, fast app switching and much more. 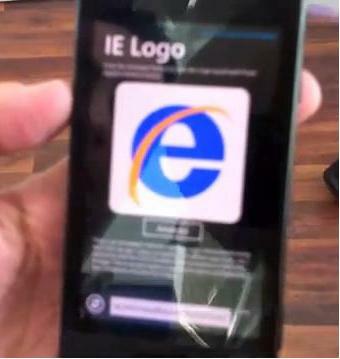 A video just emerged which shows the Windows Phone featuring the IE9 browser while also displaying some of the new features expected to arrive on the handsets with some design changes that Microsoft has in plans for IE9 for Windows Phone. Moreover, the mobile web browser is expected to release with HTML5 support which enhances rendering performance of the Windows Phone 7 device.